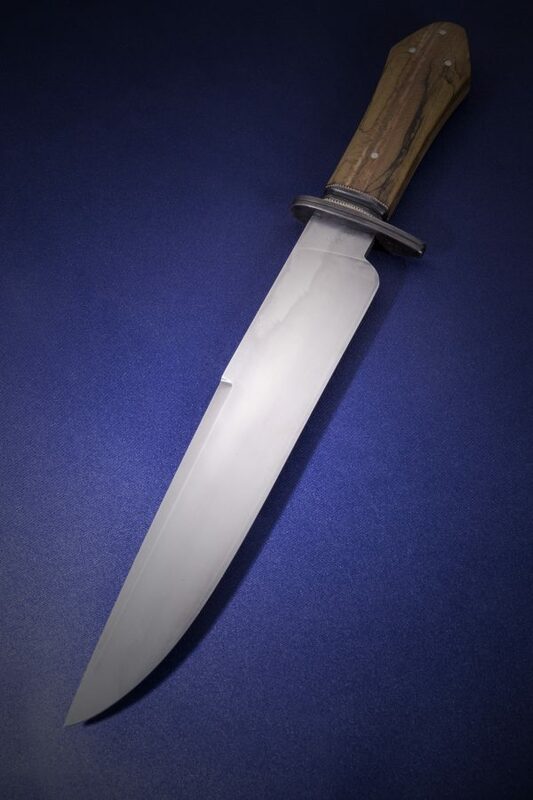 I built this knife a while back, intended for Governor Abbott to celebrate the passing of HB1935 which legalized bowie knife carry. Unfortunately hurricane Harvey literally rained on our party, so it took a while to close the deal. Because of the governor thing, many different people had a part in this project. Since this was a bowie, going to the governor of Texas, by a Texas knifemaker, I went with a collection of Texas historical materials. The blade is forged W2, donated to the project by Aldo Bruno. The handle is sycamore wood, spalted, from the grounds of the Texas Capitol building in Austin. My brother was friends in college with a guy who worked grounds crew and brought the wood home as firewood. It was ultimately dyed and stabilized by Terry Dunn, of LaVernia, TX. Terry is a TBH member, rubydog. The guard and spacer are wrought iron, blued. The material was given by Will Frary of Grapevine, TX, and came from the rail of the first railroad into Dallas, TX in 1872. The coined spacers are 1836 capped-bust half dollars. Texas won its independence from Mexico in 1836. The stand includes mesquite from Abilene, given to me by my cousin, also a 6th generation Fry Texan. The wrought iron square nails forged to shape for the stand are from the house of 1840’s settler Allen Urquhart, who founded Jefferson, TX. The nails were donated by Don Millhouse of Fredericksburg, Tx. Thanks to all who contributed to this project! We met with the Governor on Tuesday last week. He was genuinely interested in the knife's different elements. 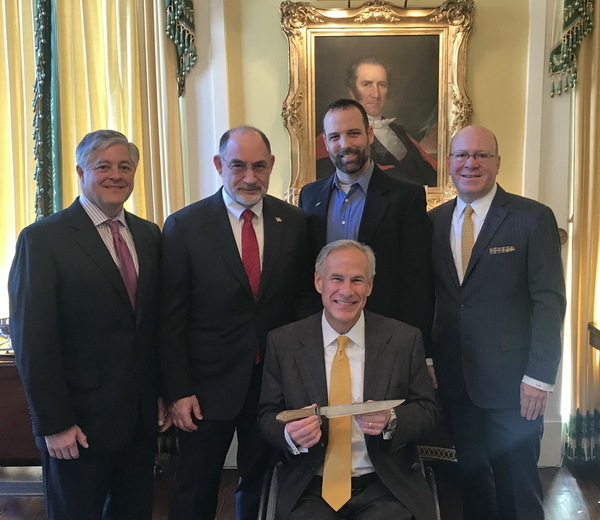 Left to right, here is Rep Frullo of Lubbock, Doug Ritter of Knife Rights, me, Todd Rathner, and the governor. My instructions were to "dress like a knifemaker, not a lobbyist." To get this second picture took some shenanigans. We were sitting in the parking lot of the Governor's Mansion about 45 minutes before our appointment, with the Capitol just across the street. That portrait of Jim Bowie is the only known picture of him when he was alive, and was purchased by the State of Texas a few years ago for nearly $300K. It hangs inside the chambers of the House of Representatives. 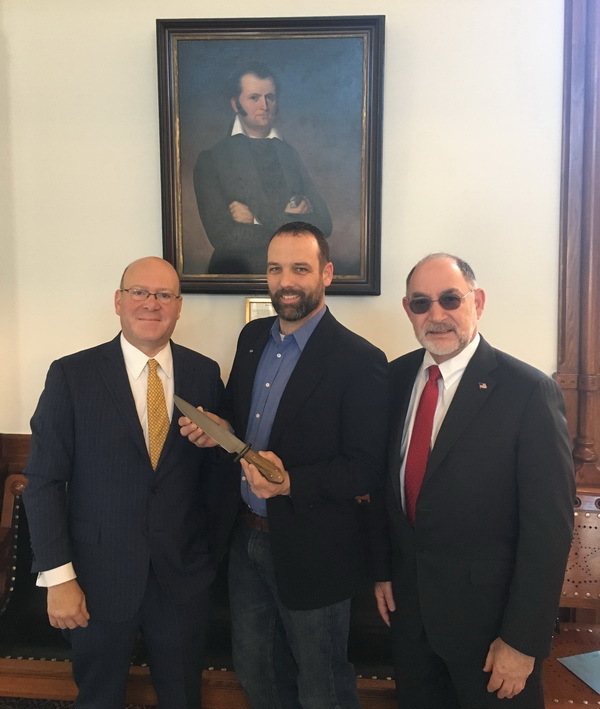 As you might imagine, one does not simply walk into the House chambers inside the Capitol with a giant knife. Even though this wasn't on the agenda, I asked Todd and Doug if we could make it happen. After a couple of phone calls, a laptop bag, and the secret squirrel entrance, we were able to get the photo. No laws were broken, but strings were pulled for sure. Thanks for letting me share the story with you all! Wow! Absolutely stunning craftsmanship and a great story with pics to share for generations to come. That's a great story and a beautiful Bowie knife ! Congrats to you Sir ! Congrats that was a great write up and Pics proved it happened. You might become a legend. That's awesome! Heck of a knife! 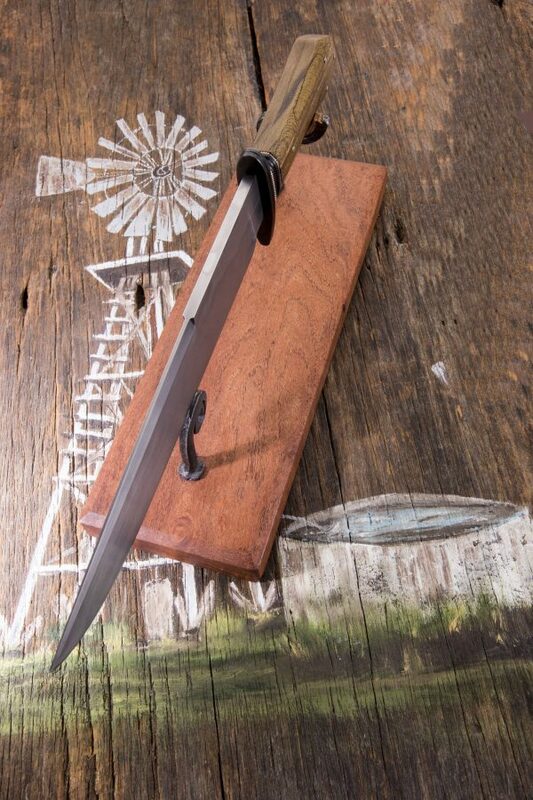 Great knife and a great story, now part of Texas History! That's incredible Jason! Love the history and makes me that much more to be living in the greatest State in the country! Thanks for sharing and great job for what you have done. Thats awesome! Congrats on a great job. That is a once in a lifetime honor. Congrats, thanks for sharing this story. Very nice knife. From one Texan to another. Thanks for honoring our history. Awesome in many different aspects. Thanks for sharing. The handle is sycamore wood, spalted, from the grounds of the Texas Capitol building in Austin. You know, there's a huge Osage tree on the grounds at the Capitol. That's what I want you to make my knife handle out of when I get elected. Awesome!! Thanks for the story and pics!! Great job and thanks for sharing. What an honor! Awesome knife and awesome story! Wow, that is awesome. What a piece of art. Wow...Awesome story! Very cool knife and its contents. You put a heck of a lot of thought into that work and did a great job. Thanks for taking us along. I wonder if he gets to keep stuff like that or it becomes property of the state and goes into the Governors collection? That is awesome, great job. Now that's a story you will never forget. Very cool. Great work on the Bowie. You know Sam, I have often thought about the wood of that HUGE Live Oak at the Alamo. The one with the pipe leg holding up the long limb stretching cross the walkway? That is famous wood many things could be made with. Picked up a sprouting acorn there a few years ago and put it in a cup, but it never survived. Great job in getting this done. Great story and beautiful knife. What a story and knife! Awesome. I saw Todd post the pics on Facebook too. Todd is a good guy. That is so cool. Great work. Congrats and cool story. That is a hell of a good job on that knife. Great work. Great knife. Great story. Thanks for sharing. What a great story and tribute to The Great State of Texas and it's founders! Thank you sir for your efforts and for sharing your story with all of us... kinda makes my chest puff up a little just knowing what a special place Texas is and what a special group of folks there are on TBH!! Great knife, and great story. All the elements make it a truly historical package. Congratulations! Very nice work! All the historical aspects of the knife are really interesting.